Absolutely loooooved this book! It was a cute contemporary with a deeper meaning hidden in there. This is my first Morgan Matson book and ugh, god i loved it. 5 out of 5 stars. When Amy’s mum moves from California to Connecticut, Amy is responsible to get the car all the way there but after the sudden death of her father in a car accident, Roger will be the one behind the wheel. Roger is a family friend, happy to drive Amy all the way to Connecticut. On their journey, they meet new people, visit diners and motels, travel on the Loneliest Road in America AND SO MUCH MORE – it’s great. There was a lot of self discovery in this book and A LOT of American discovery going on and i loved it as someone who lives in England. It dealt with a dream of mine which is to do a road trip across America. It gives you the urge to go out, explore and to just go on a epic adventure. I just want to grab a car and go road trip with Amy & Roger. This book was so fun to read! I literally felt i was on the journey with them. The over all focus however, is on how families struggle and cope with loss. You meet a lot of characters and i loved every single one of them. The character development and how the relationship built between Amy and Roger was great but i think the romance lacked and came in a little late. Other than that I LOVED EVERYTHING – the travel journal entries, the super cool playlists, the related quotes at the beginning of each chapter, the menus, receipts, photos and all the other added little extras. It just made it all feel so real. It had just the right amount of humor and emotion. Ughhh, just pick it up guys. HIGHLY RECOMMEND OK. It’s a great, cute and quick summer read. Can’t wait to read more of Morgan Matson’s stuff! The best discoveries always happened to the people who weren’t looking for it. Columbus and America. Pinzon, who stumbled on Brazil while looking for the West Indies. Stanley happening on Victoria Falls. And you. Amy Curry, when I was least expecting her. 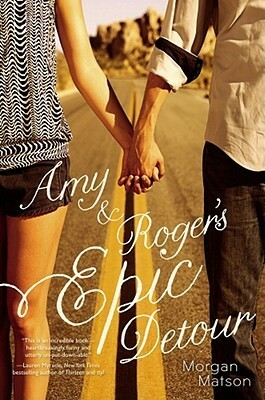 Check out Amy and Roger’s Epic Detour on goodreads! Posted on June 16, 2015 June 16, 2015 by manyreads	This entry was posted in Book Review. Bookmark the permalink. This is on my TBR pile. And after this review I can’t wait to read it! This has officially been added to my summer TBR! It sounds so good!! Thanks! Aww, that’s great! I’m so excited for you!! I’m sure it won’t be your last either, I’ll definitely be reading Morgan Matson’s other books!! Hey Hadjar, I haven’t read this Matson book. I really enjoyed her most recently released title: Since You’ve Been Gone though so I hope to pick this one up! I tagged you for The Extraordinary Means Book Tag over on my blog. I hope you will check it out. Like many of the comments I’ve been wanting to read this & your review is really the push I needed to finally just go & buy it! So happy to hear you liked it!